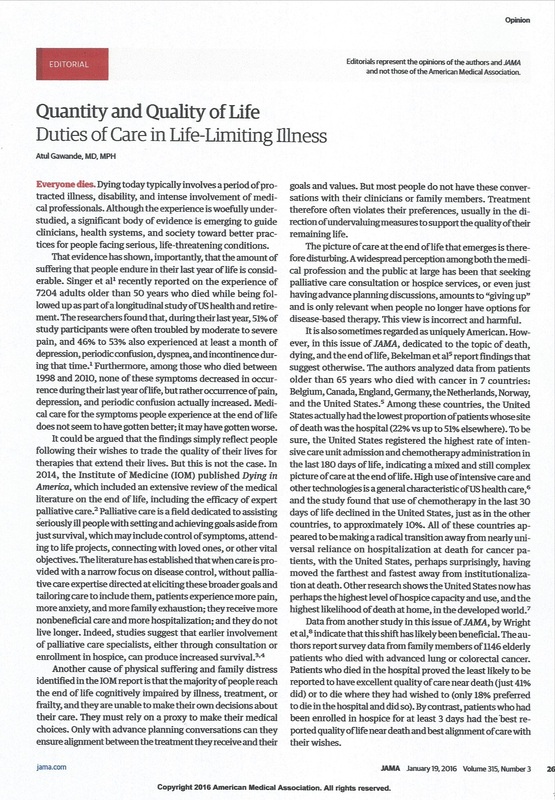 "Another cause of physical suffering and family distress identified in the IOM report is that the majority of people reach the end of life cognitively impaired by illness, treatment, or frailty, and are unable to make their own decisions about their care." "Technology sustains our organs until we are well past the point of awareness and coherence. Besides, how do you attend to the thoughts and concerns of the dying when medicine has made it almost impossible to be sure who the dying even are? " "You’d think doctors would be well equipped to navigate the shoals here, but at least two things get in the way. First, our own views may be unrealistic. A study led by the Harvard researcher Nicholas Christakis asked the doctors of almost five hundred terminally ill patients to estimate how long they thought their patient would survive, and then followed the patients. Sixty-three per cent of doctors overestimated survival time. Just seventeen per cent underestimated it. The average estimate was five hundred and thirty per cent too high. And, the better the doctors knew their patients, the more likely they were to err. ​Second, we often avoid voicing even these sentiments. Studies find that although doctors usually tell patients when a cancer is not curable, most are reluctant to give a specific prognosis, even when pressed. More than forty per cent of oncologists report offering treatments that they believe are unlikely to work."